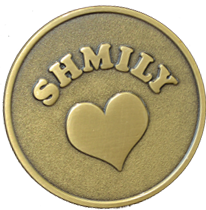 How do I share SHMILY coins with others? Imagine how touched your special loved ones will feel when they receive a SHMILY coin from you. Will they guess that it is from you the first time? How much fun can you have spreading these sentimental tokens with your special family members and friends?! You can share the SHMILY story to let your loved one know the origin of this special tradition. Then you can enjoy creating your own SHMILY traditions. Many families have found that SHMILY coins are the perfect addition to their Christmas cards! They love sending them to their extended family and friends as a thoughtful way to spread their appreciation for each other. © 2015 www.SHMILYcoins.com • All rights reserved.